In 2011, Madison Avenue got even more creative with their commercials by extending their lengths beyond the usual 15- and 30-second spots, as well as expanding their formats to go from TV to digital. These savvy strategies were used to help gain greater viewer attention and maximize online sharing in an effort to stretch dwindling ad dollars. The Wall Street Journal recently compiled a year-end list of their favorites and failures, and below we’ve featured some of their highlights and low points. 1. 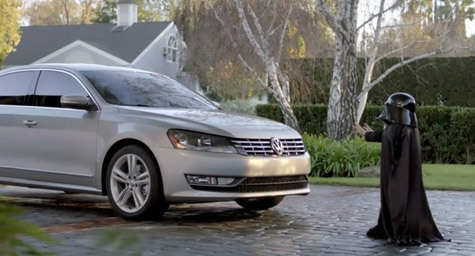 Volkswagen: “May the Force Be with You” – This Star Wars-themed commercial featuring a boy using “the Force” on the new VW Passat received over 45 million views to become this year’s most-viewed ad on YouTube. It also generated more than $100 million in free publicity and helped sell more cars in two months than the 2010 model sold all last year. 2. Allstate: “Mayhem” – These ads personify potential driver troubles into a wry man named “Mayhem.” Since the ads debuted, the insurance company has had a 17.8 percent increase in quote requests, as well as earned more than 20 million YouTube views and over one million Facebook fans. 3. Kraft Foods: “Golden Voice” – When a homeless man’s beautiful singing voice made him an online video star, he became the voice for Kraft Macaroni & Cheese commercials. This resulted in a 13% sales increase for the first quarter and 430% jump in Facebook fans. 4. Nivea: “Racial Repercussions” – An ad featuring a clean-shaven black man removing his Afro and facial hair with the headline “Re-Civilize Yourself” caused a consumer outcry of racism for the grooming products brand. 5. Groupon: “Tasteless TV” – When the daily deal company debuted an ad that showed Timothy Hutton discussing the poverty in Tibet and then eating at a Tibetan restaurant, consumers complained about insensitivity and the ad was quickly pulled. 6. Reebok: “Bad Footing” – The sneaker brand’s TV ad claimed its shoes could deliver up to 28 percent more muscle tone, but the FTC filed charges of false advertising, which resulted in the brand paying $25 million in customer refunds. To discover how to maximize your advertising for increased ROI, contact MDG Advertising.